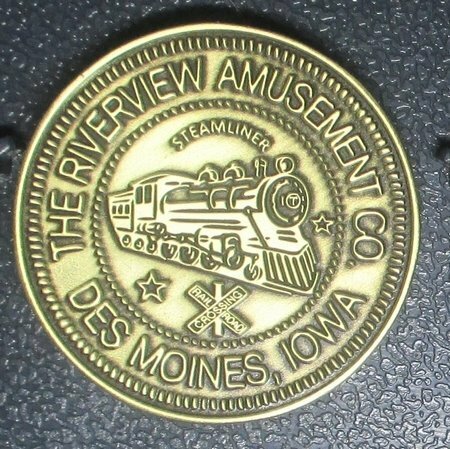 This 2017 Riverview Park Memorial "Coin4" is the 1st coin of the new 2017 Series II set of three antique bronze coin designs the Mint issued this year to commemorate the memory of Riverview Amusement Park. The coin's obverse (heads side) design depicts a portrait of the Thornton's Steam Locomotive, detailed to even show the identifying capital 'T' that was on the nose of Thornton trains. The coin's reverse (tails side) design, depicts the famous wooden Chris Craft speed boat, a popular ride for Iowans on the lagoon in the amusement park.